A North Vancouver, B.C. developer is offering a rent-to-own program for multimillion-dollar homes as a way to help would-be buyers get in to Canada's most expensive real estate market. Ray Vesely, CEO of Apex Western Homes, allows those interested to lock into a five-year lease with five per cent down. He explains the deal as similar to a traditional home purchase, but with five years to "close." A portion of the buyer's rent each month goes toward their future purchase, Vesely said. The buyer has the option to purchase the home between one and five years at the rate locked in on the date the agreement is made. If its value increases, the buyer keeps the market gains. 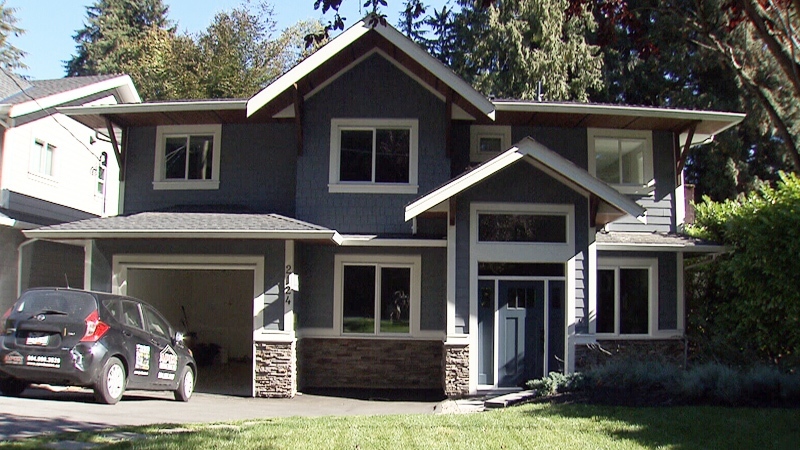 A home at 2124 Mackay Ave. in North Vancouver is available under the rent-to-own option. Rent is higher than a traditional lease, but the money goes to building up a down payment to secure a mortgage in the future. When the renter decides to exercise the "buy" option, they apply for a mortgage and use the equity already built up in the home. He came up with the idea following his own experience after a divorce, but was also inspired by his staff members' struggles. "I try to come up with creative ways to help them get a place… I've been thinking about this program for a while," Vesely said Thursday. The rent-to-own option is meant to help those who want to buy their own place, but are unable to come up with a down payment. The minimum down payment in Canada is five per cent of the first $500,000, but those buying a home for $1 million or more are required to have 20 per cent. In a market where the benchmark detached home price was $1,617,300 last month, down payments can easily exceed $200,000. Vesely showed CTV News one of the homes that could be rented to own: a 3,800-sq.-ft. house on MacKay Avenue with four bedrooms, three bathrooms and a legal two-bedroom basement suite. The home was appraised at $2.3 million. The monthly rent for the MacKay Avenue home is listed at $10,000 online, but those on a rent-to-own contract would be able to live in the basement and rent out the house or vice versa to help with the payments, Vesely said. Buyers also defer paying GST and property transfer taxes until they exercise the "buy" option. And the company is marketing the rent-to-own option to foreign buyers as a way to avoid the 15 per cent transfer tax imposed on all foreign nationals or corporations purchasing property in Metro Vancouver. However, Vesely says the offer is only available to those who are approved for permanent residency status before buying. B.C. 's finance minister says rent-to-own leases are legal, but that the ministry will be taking a closer look at the tax policy. "We're very serious about ending tax loopholes and finding those tax loopholes, so I'm very concerned and we'll be investigating," Carole James told CTV. Vesely said he's already spoken with the ministry and was told what he's offering is permitted. "Really it's targeting guys like the tech community that are trying to come in. They actually have well-paying jobs, it's just hard to save up for the down payment," he said. He added that while his program is generating interest, no one has taken him up on his offer so far. Currently the program is only offered on homes in North Vancouver, but he said he's thinking of expanding into the condo market.